The timely payment and collection of homeowner association assessments is essential to an association’s financial well-being and efficient operation. The association’s Board of Directors has a fiduciary responsibility to stay on top of assessment collection so that delinquent assessments do not accumulate, depriving the association of needed operating capital. This article provides an overview of the assessment collection process for homeowners associations in Maryland. Information is provided to help associations adopt their own assessment collection policies and procedures that work best for their communities within the framework of Maryland homeowners association law. Assessments are the means by which a Homeowners Association (“HOA”) funds its annual budget. Each year, the HOA board of directors adopts a budget to cover its operating expenses and an amount to be set aside for anticipated future expenses. The total budget cost is divided among the homeowner association lot owners (“HOA members”) in the form of an annual assessment typically due and payable in equal monthly installments on the first day of each month. Sometimes, an HOA is faced with unanticipated major expenses in excess of the funds raised by the annual assessments. In such cases, governing documents give the board of directors the power to levy a “special assessment,” subject to restrictions imposed by applicable laws. HOA members may be given the option to pay the special assessment in monthly installments. HOA assessments are traditionally paid by check using payment coupons and envelopes provided by the HOA’s management company. More frequently, management companies send electronic coupons and/or assessment invoices by email and offer online payment by E-check, credit card or recurring ACH payment (direct debit). Coupons and invoices are often used as an opportunity to remind the HOA members that they can avoid late fees and interest by making timely payment on or before the specified due date. It is recommended that all HOAs establish written assessment collection policies and procedures based on governing documents and applicable law. Written policies and procedures can be created under the rulemaking authority of the HOA and provide an objective framework under which the HOA can treat all unit owners equally. Written policies and procedures are a useful aid in the collection of assessments because they can be published and distributed on a regular basis so that all HOA members have ample notice of, and opportunity to understand, what is expected (e.g., due date and manner and method of payment) and the consequences for nonpayment (e.g., late fees, interest, returned check fees, acceleration, suspension of certain common area privileges, referral to legal counsel, and court costs and attorney’s fees if legal action is taken). Policies and procedures should be filed with the Homeowners Association Depository for the county where the HOA is located. See Maryland Homeowners Association Act (“HOA Act”) §11B-113. Written policies and procedures promote the timely collection of assessments by establishing a timeline for collection actions to be taken once a payment is missed. Written procedures instruct when an HOA should send out late notices and when to refer unresolved delinquencies to legal counsel. A timetable of deadlines for actions to be taken by legal counsel can also be specified, including sending demand letters and commencing proceedings to establish and/or enforce assessment liens, or pursue civil suits when assessments remain unpaid. When assessments become past due, an HOA can charge late fees and interest as permitted by governing documents and applicable law. Late fees and interest are not only an incentive to make timely payment, but also to help defray costs associated with delinquencies. Under Maryland law, where a delinquency in the payment of assessments has continued “for at least 15 calendar days,” the HOA’s declaration or bylaws may provide for the imposition of a one-time “late charge” of $15 or 10% of a delinquent assessment, whichever is greater. HOA Act §11B-112.1. Additionally, whenever an assessment is not timely paid, an HOA board of directors may charge interest as permitted by governing documents and rules and regulations. Governing documents may further define parameters for late charges and interest. However, under the Maryland Constitution, Article III, Section 57, the legal rate of interest is 6% per annum, unless a statute allows for a higher rate of interest. Unlike the Maryland Condominium Act, the HOA Act is silent on the issue of charging interest on delinquent accounts. Therefore, if no rate of interest for delinquent assessments is set forth in the governing documents, then the maximum interest that can be charged is 6% under the Maryland Constitution. Acceleration is another incentive for HOA members to make timely payments. Many governing documents permit an HOA to accelerate the entire balance of the unpaid annual assessment following nonpayment of a monthly installment. This means that the board of directors may declare the entire balance of the unpaid annual assessment immediately due and payable, such that monthly installments will no longer be accepted. Any attempt at acceleration must be permitted by governing documents. Suspension of a unit owner’s privileges within the community can also be an incentive to make timely assessment payments. The HOA governing documents often authorize the Board of Directors to suspend a delinquent unit owner’s common privileges such as use of common areas and facilities, voting rights and/or ability to serve on the board of directors. Before suspending a unit owner’s privileges, the HOA must comply with any notice or hearing requirements set forth in the governing documents. If the governing documents do not provide notice and hearing protections prior to suspension of common area privileges, or if those notice and hearing requirements are deemed inadequate, an HOA should create, as part of its assessment collection policies and procedures, adequate notice and hearing requirements so as to avoid a successful constitutional argument of unlawful taking of property without due process. The procedures should provide an opportunity for the non-paying HOA member to receive notice of infractions and charges, as well as an opportunity to attend a hearing with the board of directors before a final decision to suspend common element privileges is imposed. The HOA Act does not contain a mandated statutory procedure for providing notice and hearing to HOA members before suspending common privileges. However, the Maryland Condominium Act (§11-113) does contain such a procedure that HOAs can look to as a guideline when creating their own notice and hearing requirements. Compliance with the detailed procedures set forth in §11-113 of the Maryland Condominium Act would presumably be adequate to overcome a constitutional challenge under Maryland or federal law. A typical first step in the collection procedure is to send out a late notice to any HOA member who has not paid an assessment installment within a specified time following the due date. The late notice is a reminder that the assessment payment is overdue and specifies the amount and any late charges and/or interest due as a result of non-payment. If payment is not forthcoming, follow-up late notices may be sent depending on the association’s collection policy. If one or more late notices do not result in a payment, the second step in the typical collection procedure is to refer the assessment delinquency to legal counsel for collection. Legal counsel will attempt to resolve the matter amicably by sending a demand letter to the unit owner. In addition to itemizing the current amount due and requesting payment by a certain date, the demand letter provides notice of any immediate or pending acceleration of the entire remaining balance of the annual assessment and describes other legal actions that may be taken, such as: (1) recording an assessment lien against the non-paying HOA member’s lot that can be enforced by way of foreclosure (i.e., forced sale of the unit to obtain funds to pay the amount due); and/or (2) filing a lawsuit seeking a personal monetary judgment against the unit owner in the amount due, including late fees, interest, costs, and reasonable attorneys’ fees as permitted by governing documents and applicable law. In 1985, the Maryland General Assembly enacted the Maryland Contract Lien Act (“MD Contract Lien Act”) to govern, among other things, liens arising from unpaid HOA assessments under the terms of governing documents recorded in the land records. Demand letters sent on behalf of HOAs in Maryland must comply with this Act as a precondition to establishing and enforcing an assessment lien against a delinquent lot (discussed below). An HOA member must be provided with specified information about the basis, nature, and amount of the lien owed, as well as the HOA member’s right to contest the establishment of a lien by filing a complaint in the circuit court where the lien is sought to be established within 30 days after receiving notice. MD Contract Lien Act, § 14-203 (b)(1) – (7). The Demand Letter containing this information must be served upon the HOA member as specified in Section 14-203(a) of the Maryland Contract Lien Act (e.g., certified or registered mail, personal delivery, and some cases posting on the property). Demand letters and many late notices constitute an attempt to collect a delinquent debt and, to the extent applicable, must comply with debt collection conduct and notification requirements imposed by the Federal Fair Debt Collection Practices Act and the Maryland Consumer Debt Collection Act. In Maryland, persons who fall within the definition of a “collection agency” (e.g., those who collect consumer debt on behalf of another) must be licensed. Maryland Collection Agency License Act (“MCALA”) § 7–301(a). The United States District Court for the District of Maryland has held that a management company is a “collection agency” as defined in Section 7-101(c)(1)(i) of MCALA whenever it seeks to collect a debt on behalf of a homeowner’s association. Fontell v. Hassett, 870 F. Supp. 2d 395, 409 (D. Md. 2012) (“Fontell”). Therefore, any management company sending demand letters to unit owners or otherwise seeking to collect an assessment debt for an HOA in Maryland must have a collection agency license or it could expose itself to criminal misdemeanor imprisonment, fines, or both (MCALA § 7-401(b)), and also subject itself to civil liability under the Maryland Consumer Debt Collection Act, the Maryland Consumer Protection Act, and possibly the Federal Fair Debt Collection Act. Fontell, 870 F. Supp. at 409. Moreover, in addition to the management company entity itself, an employee of an unlicensed management company can be held personally liable for seeking to collect a debt on behalf of an HOA without a collection agency license in Maryland. Fontell v. Hassett, 891 F. Supp. 2d 739 (2012) (motion to amend earlier court order holding individual management company employees liable was denied). However, once a management company has a collection agency license, its “regular employees” do not require a license, while “acting within the scope of [their] employment.” MCALA § 7-301(b)(2). If demand letters do not result in payment of the delinquent assessment, an HOA’s board of directors has the power to establish and enforce an assessment lien against the non-paying HOA member’s lot. HOA Act §11B-117(b). Once an assessment lien attaches to the lot, it places a “cloud on title,” by encumbering the ability to sell the lot, similar to a mortgage, such that the lien must be paid off in connection with any future sale before the HOA member receives any part of the remaining sale price. A title company representing the purchaser of a lot with assessment delinquencies will likely discover the assessment lien before settlement and require that it be paid as a condition to issuing a title insurance policy. Without a title insurance policy, an institutional lender will not provide funding for the purchase of a lot in the HOA. Additionally, an HOA member with an assessment lien on their lot will have difficulty obtaining financing. Thus, an assessment, lien, to this extent, serves to secure an HOA’s assessment debt. Once an assessment lien attaches (and providing that required notices have been provided), it can be used by the HOA to immediately force the sale of the unit as a source of funds to pay the past due amount (the “enforcement and foreclosure of the lien”), without having to wait for a purchaser to come along and acquire the unit. Foreclosures are expensive and used as a last resort when they make economic sense. However, the prospect of having a lien established against one’s lot, or the desire to have the lien removed, is often enough to resolve any dispute over past due assessment payments without the need for further legal action. 1. What’s included in a Maryland assessment lien? In Maryland, assessment liens against a lot may consist of the unpaid “assessment and charges as provided in the declaration.” HOA Act §11B-117(b). If permitted by the governing documents, a failure to pay a single assessment installment can result in the remaining annual assessment coming due (“acceleration”) upon demand of the HOA. In such a case, the full amount of the remaining unpaid annual assessment for the balance of the fiscal year also becomes part of the assessment lien. 2. How is a Maryland assessment lien created? In Maryland, an assessment lien must be established or “created” in favor of the HOA by the filing of a “Statement of Lien” in land records of the county where the lot is located in accordance with the procedures set forth in the Maryland Contract Lien Act. Select Portfolio Servicing, Inc. v. Saddlebrook West Utility Company, LLC, 455 Md. 313, 336 (2017). Only then will an assessment lien attach to the delinquent lot. A form Statement of Lien is provided in Section 14-203(j) of the Maryland Contract Lien Act. As a precondition to seeking to create a lien, the lot owner whose property is affected must be given the notices as required by the Maryland Contract Lien Act § 14-203 (a) and (b) (described above), within 2 years of a nonpayment in violation of the governing documents. MD Contract Lien Act § 14-203(a)(1). In cases where the assessment is uncontested, the lien is created non-judicially by simply filing of the Statement of Lien in land records. MD Contract Lien Act § 14-203(g). In cases where the assessment is contested in court, the lien is created judicially by the filing of a Statement of Lien in land records, upon the order of a court that a lien be imposed. MD Contract Lien Act § 14-203(h). 3. How is a Maryland assessment lien foreclosed upon? In Maryland, a residential lot may be foreclosed upon to satisfy an assessment lien in the same manner and subject to the same requirements as the foreclosure of mortgages or deeds of trust on property containing a power of sale or an assent to a decree. MD Contract Lien Act § 14-204(a). 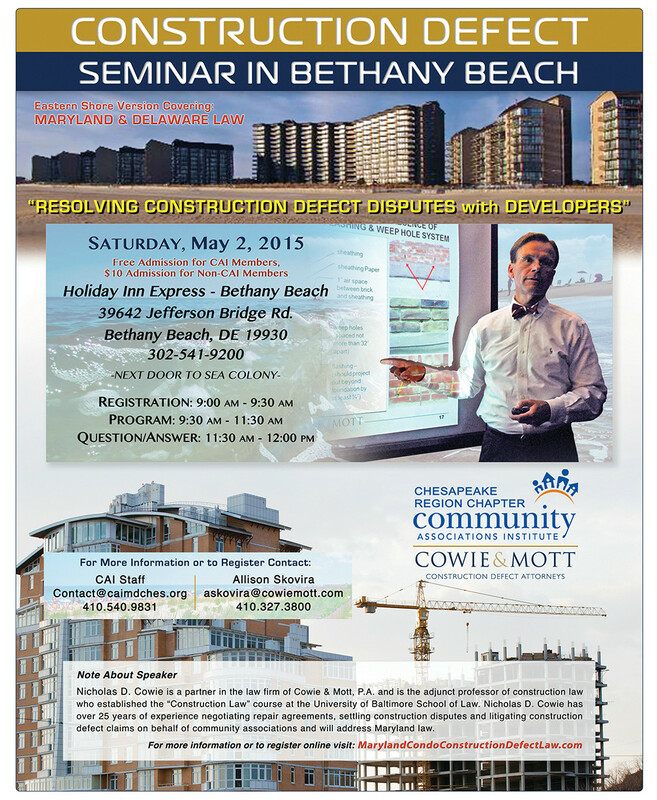 See Maryland Real Property § Article 7-105 and Maryland Rules § 14-201 et seq. An action to foreclose on an assessment lien must be brought within 12 years following recordation of the statement of a lien, MD Contract Lien Act 14-204(c), or within a shorter time period required by the governing documents. However, unlike other real property foreclosures, a foreclosure sale involving an HOA lot in Maryland may only be pursued to the extent that damages secured by the lien consist of: (1) delinquent periodic assessments or special assessments and any interest; (2) reasonable costs and attorney’s fees directly related to the filing of the lien that do not exceed the amount of the delinquent assessments, excluding any interest; and (3) do not include fines imposed by the governing body or attorney’s fees or costs related to recovering the fines. MD Contract Lien Act § 14-204(d)(2). Therefore even if the HOA governing documents impose fines for late payment, such late fees may not constitute the basis of an HOA’s foreclosure sale action. An HOA’s assessment lien on a lot in Maryland has priority, up to a specified amount, over the liens created by a lender’s earlier-filed first mortgage. This is referred to as a “super priority lien” and references the fact that in the event of a foreclosure sale, the super priority portion of the assessment lien must be paid to the HOA from the sale proceeds before satisfying the lien amount of an earlier-filed lender’s mortgage. In Maryland, the super priority lien is limited to four months of unpaid regular assessments for common expenses or $1,200.00, whichever is less, and may not include interest, collection costs, late charges, fines, attorneys’ fees, or special assessments or any other costs. HOA Act §11B-117(c)(3)(i). The super priority lien in Maryland only provides priority over “a holder of a first mortgage or deed of trust recorded against the unit on or after October 1, 2011.” MD HOA Act §11B-117(c)(2). An association’s super priority lien does not provide priority over mortgages or deeds of trust recorded before October 1, 2011,nor does it provide priority over liens or secured interest held by the state, county, or municipality (e.g., a tax lien) HOA Act §11B-117(c)(1)(ii) and (c)(2). Additionally, there is no priority over the annual charge assessed under the Columbia Association Declaration dated December 13, 1966, and recorded in the land records of Howard County. MD HOA Act §11B-117(c)(1)(i). If a first mortgage lender requests certain information about the lien, an HOA must provide the information in order to maintain its super priority. MD HOA Act §11B-117(c)(4). When faced with a foreclosure proceeding, a lender may offer to pay off the super priority lien amount on behalf of the delinquent lot owner in order to prevent the foreclosure and thereby protect its mortgage or deed of trust. An HOA can also file a civil lawsuit seeking a personal monetary judgment from a court in its favor and against the delinquent HOA member in the amount of the unpaid assessment, together with authorized late fees, interest, court costs and reasonable attorneys’ fees. A lawsuit seeking a personal judgment can be filed in addition to or in place of a lien foreclosure action, or can be used to make up any deficiencies remaining after foreclosing on the assessment lien. Once the court enters a personal monetary judgment against a delinquent HOA member, the association can seek to collect on the judgment by garnishing the HOA member’s wages or bank accounts and/or rent (if the home on the lot is being rented), subject to restrictions imposed by applicable laws. Additionally, a personal judgment entered against an HOA member by the court and recorded in the courthouse will create a judgment lien not only against the lot in question, but also as to and any other real property of the HOA member located in the county or jurisdiction of filing. The judgment can also be recorded among the land records of a different county or jurisdiction thereby extending the judgment lien to any real property located within the boundaries thereof. As with an assessment lien, a judgment lien also creates a “cloud on title” such that property cannot be transferred “free and clear” of the lien unless it is paid off by prior to transfer of title. During the collection process, it may be appropriate to agree upon a payment plan with HOA members who fall behind on their assessment payments. Payment plans can save the association the time and expense of pursuing legal action and provide an HOA member with time needed to bring their account current. Payment plans should be reserved for those cases where timely repayment of a past due amounts under the proposed plan is feasible and likely, such as where a lot owner is able to pay assessments going forward but needs help catching up on missed payments. Payment plans can also be used as a means of resolving a payment dispute by allowing an HOA member to pay off an accelerated annual assessment together with interest, late fees, costs and attorneys’ fees, if any. Payment plans should be made part of a contractual agreement between the association and the HOA member that sets forth the amount of each payment, its due date, and the mutually agreed-upon consequences of failure to make a scheduled payment. A hierarchy for application of payments pursuant to the association’s collection policy can also be included to specify which fees are paid first (e.g., court costs, return check charges, interest, late fees, and lastly unpaid assessments). The term “board of directors” is used to refer to the administrative entity made up of board members that have authority under the HOA bylaws and declaration to act on behalf of the homeowners association. The term “governing documents” is used to refer to the HOA declaration and bylaws. Nicholas D. Cowie is a partner in the law firm of Cowie & Mott, P.A. and has been representing community associations for over 29 years. The law firm of Cowie & Mott, P.A. provides general counsel legal services to condominiums and homeowners associations throughout the State of Maryland and the District of Columbia, including assessment collection, drafting resolutions, developing assessment collection policies, contract negotiation, legal opinions, foreclosure actions, litigation, arbitration, mediation services, bylaw amendments and other general counsel services tailored to homeowners and condominium associations. The law firm of Cowie & Mott, P.A. offers flat fee assessment collection services with deferred billing. Please contact our firm for references.